The four Applicant Countries in the so-called Visegrad Group - Poland, Czech Republic, Slovakia and Hungary - are planning to co-ordinate next years referenda on EU- membership, reports EUobserver.com. The idea is that the country with the highest support for EU-membership will hold the referendum first to influence the outcome in the other countries. The same method was used in the referenda in Austria, Finland, Sweden and Norway in 1994. Austria voted first, then Finland, Sweden and Norway. But the Yes-votes in three first countries did not convince the Norwegians, who rejected EU-membership for the second time in November 1994. A repeat serial attempt for membership of the single currency came unstuck when Denmark voted against and where Britian is still to hold a referendum with opposition mounting by the day. 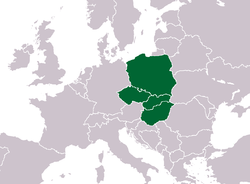 If the same serial method is applied to the Visegrad-countries, the first referendum will probably be held in Hungary where around 80 per cent of the population are in support of EU-membership. The next country might be Slovakia where around 60 per cent are in favour. Poland, where more than 50 per cent is in favour, might be the third country holding a referendum. The last country will probably be the Czech Republic where support for membership is about 40 per cent - the lowest among the four countries. "This way of planning the coming referenda in the Applicant Countries shows that the Yes-side in each country does not trust the strength of their own arguments. They seem to need other countries Yes-votes as support", says Gorazd Drevensek, member of TEAMs Board and active in the non-parliamentary party Nova Stranka in Slovenia. "This manipulative way of doing politics is not likely to increase the support for EU- membership. It will probably make it even harder for the Yes-side in each country to win the coming referendum. Instead of manipulating the dates, the referenda should be held in the same day in all Applicant Countries", says Gorazd Drevensek.